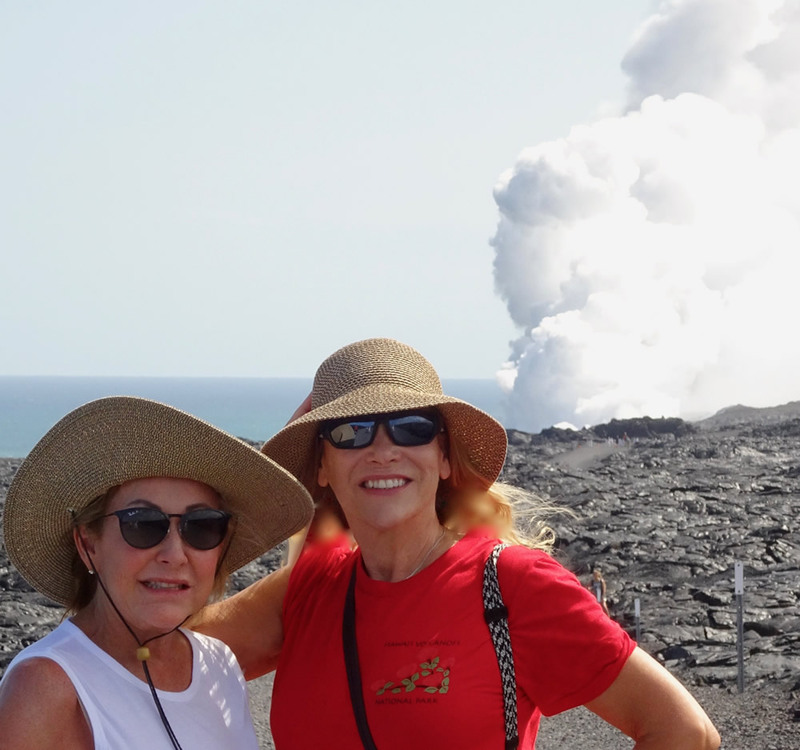 Laguna Beach artist Fitz Maurice, right, and her friend Mindy in Volcanoes National Park in Hawaii. After capturing in paint Haleakala National Park on Maui, I island hopped over to Hawaii to pursue Volcanoes National Park. Felt like such a jet-setter to be island hopping with my Maui friend Mindy. I love it when friends share the quest with me and I still have about 20 more national parks to paint before accomplishing my quest to capture in oil paintings all of the 59 national parks. We rented a car and drove to the top of the island, a crater in Volcanoes National Park. Hiking out to the volcanic crater was easy and delightful, but the crater itself was disappointing. It simply looked like a big hole in a crusty brown terrain that stretched out as far as my eye could see. Yes, there was a small red glow inside the center of the crater with a sliver of smoke rising, but that did not inspire me to create a work of art. Now what? We came all the way here so I could paint Volcanoes National Park. The quest must go on. The only other place significant to this national park is where the lava meets the sea. We drove all the way back down to sea level. Then took the road that led to where we could walk across endless miles of dark solid lava to reach the sea. Standing at the ocean edge, I watched as the red-hot lava crashed into the cool blue sea, exploding like a bomb ejecting tons of gas and ash into the sky. Now there was a sight to behold! That is inspiring. In fact, what I was watching was birth, land was being born in front of my eyes. Once the lava spills over the rock edges it cools, hardens and in this way the island of Hawaii is growing larger daily. The artist’s drawing for what she envisions in a painting of Volcanoes National Park. I found the inspiration to paint the ultimate iconic scene of Volcanoes National Park. I always draw out the entire composition and give attention to iconic plants, animals, symbols that are affiliated with the particular park I am representing. I hope you can see in this drawing my excitement in the explosion of two worlds colliding and causing a violent eruption that creates life. 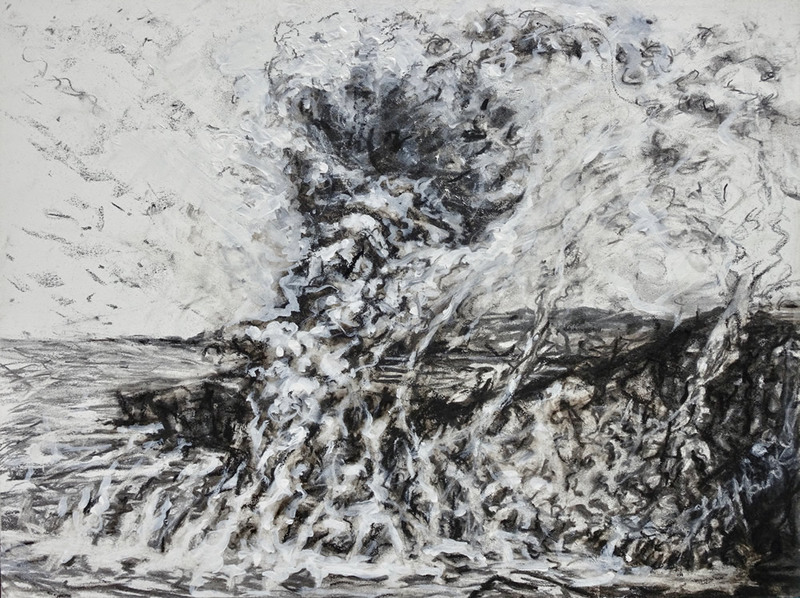 Watch for the next “Stories From the Woods” featuring the finished oil painting of Volcanoes. See Fitz Maurice’s quest work at nationalparkpaintings.com Work by the lifetime artist and 30-year south-county resident has been exhibited and collected internationally. Glacier National Park, Montana, and the Hockaday Museum of Art plan an exhibition of her National Park series next June and July.